TCOYD. YCDT. Some acronyms from a few weekends ago. 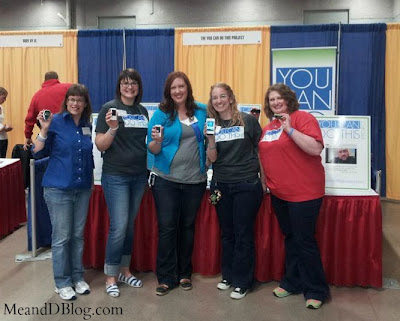 I travelled to Des Moines to volunteer at the You Can Do This Project booth at the Taking Control of Your Diabetes conference. And to see some friends. This would be the only pic I have of the weekend. Some of my friends REALLY like to take A LOT of pictures (cough, Kim, Sara, C, cough, cough) and so I tend to rely on them at these gatherings. Friday night as people straggled in, we had dinner at Zombie Burger. It was a really long wait, but totally worth it. I highly recommend the garlic, bacon, and blue cheese fries. They're pretty serious. After staying up way too late talking to everyone, getting up Saturday morning was rough. But Sara, Josh, and I made it to the convention center in time to hear Dr. Edelman's opening presentation. The exhibit hall was closed during that session, but we snuck out a few minutes early to get back to the YCDT booth. This was my third time working the booth. And each time has been different. One of the differences at TCOYD is that most of the people in attendance had Type 2 diabetes, where FFL and the JDRF walk were focused on Type 1. The response to the project was once again overwhelmingly positive, though there were quite a few little old ladies who said, "Oh, I don't have a computer." And C came up with a great answer for them: "That's ok. You still have something to share that can help someone else." I love that! Go C! 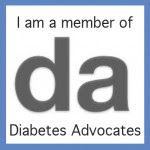 When I was telling people about the project, I would say that diabetes can be very frustrating and isolating. More than once, after making that statement, people looked at me like they had never heard someone say that before. "Yes, it is!" they emphatically agreed. To me, that shows that we were needed. That this project is needed, no matter what type of diabetes you have. I really hope some of the people we met decide to make videos. I'd love to see a larger Type 2 presence in YCDT. At the end of the day, we packed up the booth and headed to dinner with everyone. A big long table full of PWDs and a few Type Awesomes. Gatherings like this are so good for my soul. I feel so blessed to have been there. The evening concluded with a walk through a spectacular sculpture garden downtown. Sara, Kim, and Mike took some fabulous shots. It really was beautiful. Some of us got together again Sunday morning for brunch (pumpkin pancakes, FTW), and then it was time to head home. Which is always the hardest part. Some of these people I've met online have become real life, tried and true friends. And I can think of no better way to spend the day with these friends than working the YCDT booth. When's the next event I can go to? I'm ready! I hope you guys keep having booths at TCOYD conferences. It definitely makes it more fun. Awesome!! I'm so proud of all of you!! This makes me very very happy... thanks for everything you've been doing Jess, and for being a part of making YCDT and all the acronyms in the DOC so very special and outstanding. Love the video! This was certainly a different booth experience than FFL but it was good to brainstorm how we can reach the offline community more with what is mostly an online project. I'm glad we were able to connect with HCP for that. And really, when is our next event? !